The joy of peeling off your Tinkerbell nail polish. I grew up somewhere in the middle of being a tomboy and a girly-girl. As a really young kid, I had Barbie dolls and My Little Ponies and stuffed animals. Once my brother came along, Barbie mingled with He-Man and Optimus Prime, because that’s just how it was. And in between bouts of Atari madness and outdoor adventures, I took up a proverbial interest in all things female, including clothes, shoes, and make-up. For a long time, I wasn’t very good at any of them, especially make-up. A friend of mine had one of those Barbie styling heads, and we spent hours putting crap unfit for human use on her face and doing up her hair. But when it came to trying out lipstick and eye shadow on my own face, I never got it right, with my skills teetering just left of circus clown. But there was one make-up item with which I developed a very lasting relationship: nail polish. My obsession with the stuff hit an all-time hit by the time I reached college, but it all began, as so many obsessions do, with a seemingly innocuous play product: Tinkerbell nail polish. Tinkerbell’s “brush on, peel off” nail polish was just one product from an odd yet popular kids cosmetic line from the 1980s that had nothing to do with Peter Pan or Captain Hook. (And that eventually got sued by Disney, apparently. Imagine that!) It came in a number of colors, most of which I remember as being variants of either red or pink. And it worked just like regular nail polish, except that it dried as a plastic “sheet” on your nails rather than a hard lacquer, so it was easy to peel off. And that was the idea. Young girls could easily switch from polish to polish without the use of chemicals. Easy peasy! I ||shudder|| to think that I probably got a kit like this and thought nothing of putting that “lipstick” on my actual face. I had amassed several bottles of the gunk by the time I hit middle school. Even though I still couldn’t put on mascara to save my life (not that I really wanted to), I took immense pleasure in covering my nails day after day, only to peel off what was left by bedtime. It didn’t leave and marks or irritation, and I eventually got use to the smell. Probably too used to it. Once I got my first bottle of real nail polish when I was in high school, the Tinkerbell bottles were trashed. One of the problems with the stuff was that it became very thick over time. The same problem applied to real nail polish, except that rather than becoming simply thick and gooey, Tinkerbell nail polish became a hard, solid mass that was completely unusable. I remember finding a few stray bottle one year upon cleaning out my room for a garage sale. One I couldn’t even open. I managed to pull the top off the other with the brush remaining permanently affixed inside. Like a minimalist sculpture. The stuff still had that old nasty/wonderful smell, though it had been muted by years of disuse. But by then, I had become too accustomed to the formaldehyde-y goodness of real nail polish, so maybe my nose couldn’t tell the difference. 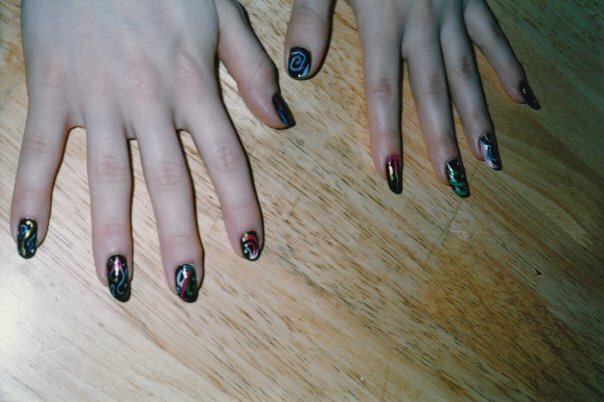 My nails, in college, done by one of my best and most artistic friends. Oh my gosh, I haven’t thought about this stuff in years! My best friend had the newer lipstick and nail polish set (and maybe there was a “perfume” that went along with it?) and I coveted it SO HARD until I actually smelled it one day and then…not so much! Plus the polish changed colour in the bottle over time, and it wasn’t a colour changing polish! Oh, I think you’re right about the “perfume!” I seem to recall a liquidy product of Tinkerbell’s being spilled (knocked over by the cat…surely) all over the inside of our toy chest. My mother was none too happy, and it made several of our Barbies take on a rather…um…flowery(?) burnt(?) smell for a long time. That sounds like something I would put on just to wait until it dried and immediately pull it off. Then I’d repeat the process. I wish they still had this. I had never heard of it before, so it must have been discontinued before my time. Haha, peeling off the stuff was half the fun! I can certainly remember trying out many different colors over the course of a day. Brush on, Peel off, just like it says, over and over and over! I think there’s a company that still makes a nail polish like this, but it’s not Tinkerbell. I’m not sure they’re even around anymore, but I should check into that..